Kelvin Gastelum sent an emphatic message to the middleweight division with a devastating first round knockout against former champion Michael Bisping on Saturday in China. Gastelum, who had teased a return to welterweight following a loss to Chris Weidman in July, decided to stick around at 185 pounds for at least one more fight when he was offered a matchup with Anderson Silva in November. Unfortunately for Gastelum, Silva was pulled from the card just a few weeks ago after he was flagged by USADA for a potential UFC anti-doping policy violation. That’s when Bisping offered to take the fight just one week removed from his loss to Georges St-Pierre at UFC 217 in New York. Bisping insisted that he wanted the chance to wash the bad taste of a defeat out of his mouth and that’s what this fight would afford him. Sadly, Bisping is now sitting off two straight losses after Gastelum dealt him a jaw-dropping knockout in the first round in the UFC’s debut card in Shanghai. Gastelum showed a ton of confidence early as he stalked Bisping around the Octagon, throwing hard combinations including several big shots that landed to the body. The former “Ultimate Fighter” winner seemed to almost disregard Bisping’s counter punching as the 38-year old veteran fired back by using his range and reach advantage to try and keep Gastelum at the end of his punches. The strategy didn’t work as Gastelum kept pressing forward and digging into Bisping with shot after shot on the feet. Finally as Bisping attempted to throw a combination, Gastelum slipped one punch and returned with a short right hand followed a left hand that demolished the former champion and sent him crashing to the canvas. Referee Marc Goddard quickly jumped into stop the fight before Bisping could take anymore unnecessary damage as he laid unconscious on the ground. Gastelum’s win came at 2:30 into the opening round. 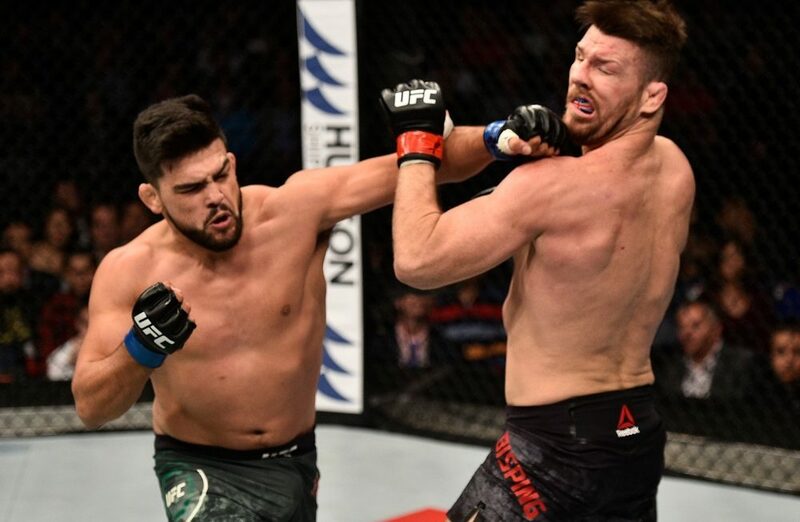 Following the victory, Gastelum was quick to aim for the top of the middleweight division by asking for a fight against interim champion Robert Whittaker, who has been out of action since July dealing with a knee injury. While Whittaker is expected to face Georges St-Pierre to unify the middleweight titles next year, Gastelum took his shot knowing that the UFC needs a headline fight for the upcoming pay-per-view in Perth, Australia in February. Considering that’s Whittaker’s backyard, it wasn’t a bad move on Gastelum’s part at all. “This was the biggest win of my life. I have a huge amount of respect for Bisping for stepping up,” Gastelum said. After suffering a second straight loss in three weeks time, Bisping still seemed in good spirits while paying credit to Gastelum for getting the win. The finish on Saturday was the quickest loss of Bisping’s career, but he’s still not done yet as he plans on taking at least one more fight before retiring from the sport. “I just want to say congratulations to Kelvin Gastelum. Job well done tonight,” Bisping said. “He caught me with a good shot, god bless Kelvin, he’s young. I’ve done this for a long time. I’m getting old. Bisping has said he hopes to fight again in March when the UFC returns to London but following the knockout on Saturday it’s unknown if he’ll be cleared in time to return by that date or not.